Gavin Larsen and Adrian Fry in Who Cares? Gavin Larsen, Brian Simcoe and myself are leaving early in the morning to catch a ferry in Port Angeles, WA headed for Victoria B.C. 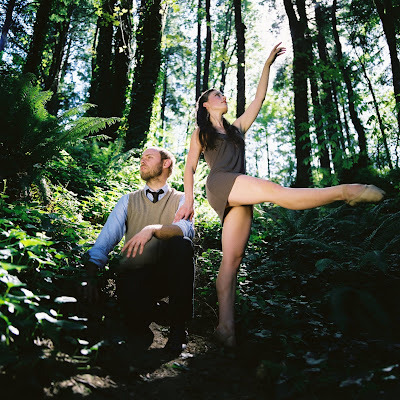 The three of us will be dancing varied Balanchine repertory in collaboration with Ballet Victoria for their next program entitled, "The Secret Garden and Other Works." Paul Destrooper, former OBT dancer, took over the company in Victoria upon his retirement from OBT in 2007. Gavin and I will open the program with Balanchine's Apollo, me beginning with a solo and then continuing on with the pas de deux. 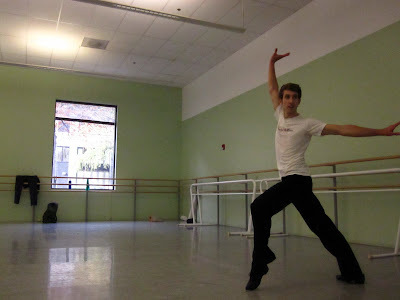 Brian will dance the "Liza" solo from Balanchine's Who Cares? 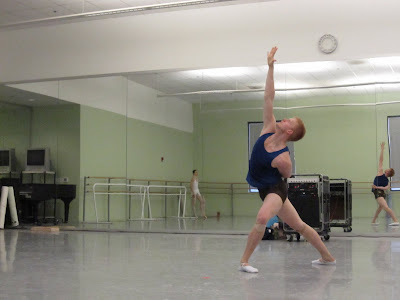 And Gavin and I will close the first act of the bill with "The Man I Love" pas de deux, from Balanchine's Who Cares? Gavin Larsen and Adrian Fry in Balanchine's Apollo. Brian, Candace Bouchard and I went up to work with Paul in Victoria before he took over the company in March of 2007. In the week we spent there Paul created a version of Carmina Burana using the three of us and the dancers from the company. The week culminated in a small studio performance, and I remember it being a very fulfilling experience to be created on, grow with my peers and see the talent that he has drawn to the young company. It's been great to be working on these ballets in our time off since we closed the Emerald Retrospective two weeks ago. I am looking forward to dancing these great ballets with great colleagues this weekend. Brian Simcoe in Who Cares? All we can say is WOW! So excited to see this next week. November 3-5 @ Mississippi Studios. Just thought you readers would appreciate an update on Candace Bouchard & team's* progress with Uprising. *The "team" being Leta Biasucci, Ansa Deguchi, Steven Houser, Olga Krochik, Grace Shibley & Lucas Threefoot. There's just 11 days before their November 3rd debut at Mississippi Studios, so if you haven't yet purchased tickets, click here to do that! 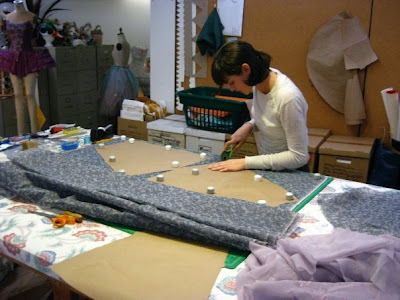 In addition to over an hour of dancing to learn and rehearse, the particularly crafty Grace Shibley & Steven Houser have teamed up (with Candace's direction) to design and make the costumes for the evening. It's a pretty big undertaking and everyone here at OBT is very impressed and proud of the effort this group has (and continues to) put into this project. We'll keep you posted as more behind the scenes stuff unfolds or you can stay up to date by becoming Uprising's fan on Facebook here. Yesterday marked Principal Dancer Artur Sultanov's 30th Birthday, which at OBT comes with the passing down of a certain shirt (see photo). Apparently this shirt has been passed down to company members on their 30th birthday for about 8 years now, and I thought it would be a really great tradition to share with you all. It reads "30 and still frisky." Which, clearly, Artur is. :-). In other news, yesterday began our 5 week layoff between our fall program and The Nutcracker. Every year we dancers go through a series of layoffs between programs, and the length of these layoffs vary from season to season. This season my contract was reduced from 34 weeks to 25 weeks (I won't be dancing in the "Duets" program in the spring), meaning I'm working less than half the year. So stay tuned because I'll be sharing with all of you the ways in which I'll be getting creative to stay in shape and hopefully earn a little money. I have no current plans to search for retail work, but upcoming "projects" include: OBT Uprising with fellow Soloist Candace Bouchard (www.obt.org/uprising), a possible tour with a small group of OBT dancers, dog sitting, teaching, a trip to a warm beach (this is neither keeping me in shape or generating income, but hopefully will boost my morale and sanity), and time spent with friends. Who knows, I might even do something crazy like clean my apartment! Anyway, I thought it would be interesting for all of you to know not just what goes on when I'm rehearsing and performing with the company, but also what I'll be doing with the remaining 27 weeks of the year. I want to be clear that none of this is coming from a place of anger, but that I think it's important to share what it really means to be a ballet dancer in today's economy. There was a recent Oregonian article about how the dance world is adjusting to the recession (http://blog.oregonlive.com/portlandarts/2009/10/the_dance_world_adjusts_to_the.html) and in it Andrea Snyder, the Excutive Director of Dance/USA, is quoted as saying "I don't think it is as dire as people project it; when you never have anything to begin with, you don't lose it." I couldn't really disagree with her more. We didn't have nothing, we had very little, and when you take anything away from very little, it is felt more severely than when something is removed from a larger amount. She did mention how creative we are and how that leads to resilience, which I completely agree with. We are very creative people by nature (go figure), but at the same time, creativity is not as valued as productivity in our culture. All of that said, I feel very fortunate to have the job I have, and to dance for Christopher, OBT, and Portland. I really love this city, and I don't think I could find a better group of people, dancers and staff, to work with and I'm excited about all of the upcoming challenges and growth that will be taking place. Hope you are all enjoying this AMAZING fall foliage! Rose City Waltz has brought cheers from the audience each performance so far, which is no surprise, but what an incredible confidence- and character-building experience that must be for these young dancers! Out of the ashes, there comes new growth. The silver lining to last season's financial crisis is that it gives us an opportunity to openly reevaluate our methods and blaze new trails. For me, personally, it exposed some secret vault in my brain that I didn't even know existed. I remember having a conversation with Brian Simcoe last spring about life after being a dancer. I told him I thought that if I couldn't be a dancer, I couldn't work in the dance world. I didn't have much love for teaching, I had no desire to choreograph, and I couldn't imagine what a difficult path it would be to become a ballet master or director, being constantly reminded of how much I miss pushing my limits and feeling the music overtake me. I'd always be an enthusiastic supporter and audience member, but whatever work I chose to do after dancing, it wouldn't be in ballet. Except I've had an idea rolling around in a nebulous, unrecognizable form for a couple of years now that completely goes against what I told Brian. Too focused on becoming a better dancer (and bartender, and person in general...), I always pushed the idea away, knowing that since I had no interest in being involved in the dance world as anything other than a dancer, it would never come to fruition. A couple of weeks later, though, I found myself telling our director, Christopher, about it. As my mouth formed the words, my brain shouted, "Stop! This will mean doing all the things you say you don't want to do!" Fortunately, that part of myself (heart, soul, spleen, or just the other half of my brain) that makes me an artist remained louder and just kept talking. I explained that I wanted to create works to perform in alternative venues around town where people outside our normal community feel more comfortable. Where the audience doesn't feel like they're being forced to sit down and over-intellectualize the ballet, but can instead wander around with a drink in their hand just getting what they feel from dance. If the level of intimacy between performers and artists changes so drastically for us between the Keller and the Newmark, how much deeper will it be at a music venue where half the audience could wander up and touch the edge of the stage? As soon as the performance space in my mind changed, once I took out the proscenium and added audience members with beer, I discovered that I was full of good ideas for choreography. Portlanders love good art, and I want to give it to them any way I can. Find out more about the performances here. Listen to Horse Feathers' music here. And buy tickets to see myself (for aforementioned reasons of not being able to stand the pain of watching other people dance if I can't participate), Leta Biasucci, Ansa Deguchi, Olga Krochik, Steven Houser and Lucas Threefoot perform onstage with Horse Feathers at Mississippi Studios. It will be like nothing you've ever seen before. That I can promise. .... is done. We ran through the entire show one last time tonight, for a small invited audience of donors, supporters, and especially our crew of devoted volunteers who have given more in time and enthusiasm than can ever be measured. It was really fun to dance specially for them tonight. It's always hard to feel like simply saying "thank you" is enough. Knowing that tonight they were treated to the best seats in the house and a special performance of their own was wonderful. I didn't dance in the first half of the program tonight, so I went out front to watch the first of two films and the opening of Emeralds. The film chronicles OBT's history and highlights the important place this company has had in Portland since 1989. There are beautiful clips of ballets and dancers from over the years. And then the curtain went up on Emeralds, and the future of OBT was so clear and exciting. 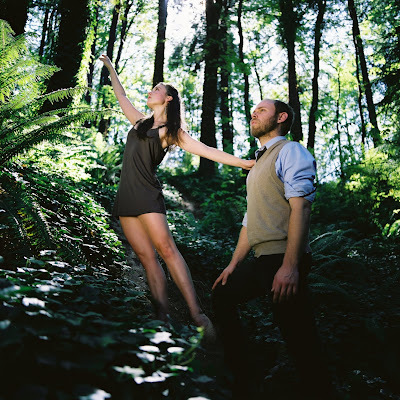 Emeralds is an introspective ballet for both dancers and viewers, and I think that is quite appropriate at this point in time. It takes you right out of the crazy world outside and right into the atmosphere of romance, artistry, and commemoration. Elyse keeps telling us that the final section of the ballet is "to Mr. B", at whom our gazes are directed. If you look closely, you'll notice that the dancers direct themselves at the end the ballet to a spot up near the top of the wings on downstage left. We're commemorating Balanchine, who crafted this gorgeous ballet, and also looking up to all the dancers who've gone before us and will come after. And now for tomorrow! Merde, everybody! Linda Besant has been busily assembling the photographs, posters and memorabilia for this Emerald Anniversary retrospective program, which will all be displayed in the lobby of the Keller auditorium throughout the run of performances. I snuck out front this evening to take a look. It's not at all completed yet, but I got a nice chance to chat with Blaine Covert, who was there helping Linda determine photographic credits for some of the older photos. Blaine's been shooting OBT since before it was OBT, meaning that he has seen it all. Quite literally, he has observed more closely the evolution of this company than just about anyone else. Here he is, adjusting the placement of one of his photos of a Canfield ballet called Neon Glass. Right now the rest of the lobby looks like this, but come Saturday night the displays will be completed. 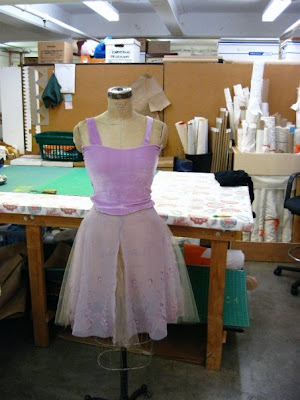 I was tickled to see that my Sleeping Beauty tutu is on display! (It's really worth a look--- it's gorgeous. OBT's costume shop did an extraordinary job crafting it). Our first tech rehearsal this afternoon struck me as momentous, even though it was treated just as any other working rehearsal. The last time we were all in this theater was June 12, the night of Dance United. At that point, it was questionable whether we would again all assemble there to dance on that stage. But here we are, dancing and working again. Last June seems like years ago now, kind of blurred in the flurry of activity that's surrounding our new season. What a wonderful feeling to be able to look behind us to pay tribute to OBT's past, and look forward to our future as well. Final studio rehearsals today and tomorrow, and then tomorrow night we move to the theater to begin tech-ing for Saturday's opening. The production crew has been there since yesterday, loading in, laying the floor, and setting cues. This show is going to keep everyone backstage on alert all night long since there are eleven ballets (am I counting right?) instead of the usual three or four. When I went in for my final Emeralds costume fitting this morning, Kathy Scoggins, our wardrobe mistress, expressed some apprehension mixed with resolve about the number of quick changes she has to orchestrate. We did do two costume run-throughs in the studio last week without catastrophe, but running this program in real time and space could be a different ball game. The mood throughout the company is fantastic, very excited and ready to get back onstage where we belong. I'm really proud to be a part of this program, to look back and honor the company's history and recognize that I am a part of it. So many OBT alumni will be at the performance on Saturday night, and we'll all be on stage at the end of the evening to bow together and share a moment of pride in our contributions to Portland's ballet company. Just thinking about how important and momentous that is gives me goosebumps. I hope in another twenty years I can join the 2029 OBT company members for another retrospective.